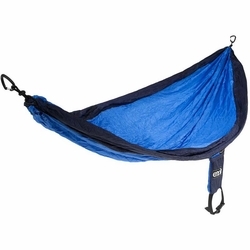 ENO Single Nest Hammock. Eagles Nest Outfitters. Don't feel like sharing? The SingleNest understands. Pull the SingleNest out of its soft-ball-sized stuff sack, clip it to your handy-dandy SlapStraps, and settle in for some me-time. Light enough to make the backpacker's cut, but robust enough for backyard luxury, the SingleNest is the go-to for any occasion. Folded dimensions	(Dia x L) 3.5" x 4.5"
Unfolded dimensions	(L x W) 9' 4" x 4' 7"